This fabric marking pencil is much better for marking fabric than a normal HB pencil and a fabric marker pen (texta). Why? It has ceramic lead that is designed to be easily removable from fabric. It washes out easily and rubs off using the included eraser. It does not sink into the fabric in the way that a marker does, and it won't bleed as markers sometimes do. The lead thickness also means that you always get a constant line thickness, unlike regular pencils which need regular sharpening to maintain a fine line. With a constant lead thickness, you always get a constant line thickness. No need to carry around a pencil sharpener; the lead is always ready to go, whenever you are. Where possible, the method I prefer to use is to gently hand wash the embroidery. However, there are times where washing is not possible (such as when threads or fabric are not colourfast), and then you could use the eraser method. When the lead gets worn down through use, more lead can be exposed by pressing down on the eraser at the top of the pencil. A click will let you know that the lead has propelled. To retract the lead, press down on the top of the pencil, and with the other hand, gently push the lead back into the barrel of the pencil. When the eraser gets worn down through use, more eraser can be exposed by holding the hot pink top section of the pencil (where the metal clip is) and twisting the lower part of the pencil. To retract it, simply twist in the opposite direction. 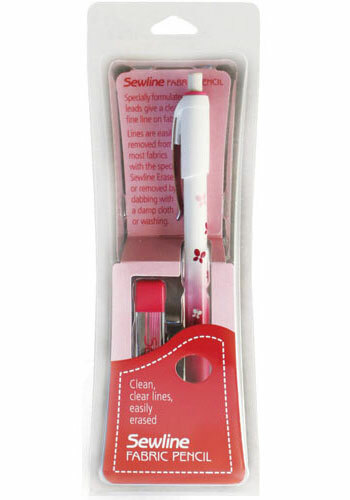 This wash out/erasable fabric pencil is perfect for all your embroidery marking needs. I use mine regularly for any embroidery where patterns and lines need to be marked on my fabric, such as Mountmellick embroidery and Portuguese whitework. Because it washes out easily, I never need to worry that I'll be left with ugly line markings on the finished embroidery. Replacement leads are available in grey/black, and white. Replacement leads have 6 leads in their own storage caddy. NB: Always patch test on the fabric to ensure lines can be removed satisfactorily. As with fabric marker pens, markings should be removed before ironing. 1 lead included in pencil, and 6 replacement leads in a storage caddy. Eraser included in end of pencil.